Description: Power for tonight's D&H 165 train also known as NS 31J rests here under the Walt Whitman Bridge on a sunny afternoon. Title: While pacing the CP main, I spot a SOO liner in the back and it was ON!! Title: You don't see THIS kinda stuff back in VA!! Description: Trailing behind the 2032 is CP 6021, pretty good lashup! Description: A Soo Bandit GP40 leads a CP SD40-2 over the Mississippi River in the early morning light. 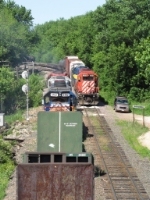 Description: The 6021 leads the SOO 6034 on the main at Humboldt. Wishing to catch this again in nice sun near Northtown, but had to leave prematurely. Description: CP 6021 teams with the SOO 6034 on Train 183 this morning. Description: Two SD40-2s idle in the yard. Description: An eastbound with plenty of power rolls through Belgrade on an unseasonably warm day. Description: A leaser leads an eastbound under the MN-55 overpass on the east side of Belgrade. Description: The only good kind of rail train: New rail to be put down. Description: Two trains wait to be recrewed outside the depot in Glenwood. 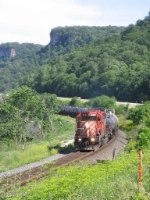 Title: CP 6021 CP's Tomah Sub. Description: A fantastic consist brings 330 across the river and up the hill at Marshall St., shown here passing the classic codelines put in many years ago by the Soo Line. Description: on a whim after work I drove 40 miles to Fairmont to see what was there and caught a CP Eastbound and a wayfreight behind these guys. Description: Train 498 with the oldest engine of the bunch leading. Description: Late running D&H 164-28 really pushing things daylight-wise here eastbound on 2 approaching the 165E signal on the Harrisburg Line at Swedesburg with just 2 intermodal cars, 6 containers and 11 mixed freight. Description: Late running D&H 164-28 really pushing things daylight-wise here eastbound on 2 by the 165E signal on the Harrisburg Line at Swedesburg with just 2 intermodal cars, 6 containers and 11 mixed freight. Description: Late running D&H 164-28 really pushing things daylight-wise here eastbound on 2 of the Harrisburg Line at Swedeland with just 2 intermodal cars, 6 containers and 11 mixed freight. Description: 30J is very late this day as it passes through Swedeland at 1510 with a pair of SD40-2's. Description: Northbound at Race st. with rare daylight move. Description: A late start for re-symbolled D&H train - was 164, as this inaugural run of D&H 158 heads west over the high line toward terminus at S. Philly Yard. The sun came out, as usual, after the power went by ( it can be seen lighting the ground area behind the high line here ). Description: CP 5910 & 6021 up close and no stranger to the snow, has a face full leading NS 31J / D&H 159 westbound through Swedeland. Description: Seemingly assigned to this run are the same 2 units for the umpteenth time in a row, here shuttling D&H 158 / NS 30J a total of 138 axles westbound on the ex PRR / Conrail high line. Description: Pair of veteran CP Rail SD40-2's haul D&H 158 / NS 30J westbound along the ex PRR / Conrail now CSX high line.